We performed an abrasion test, using this rusty rebarb as out abrasion machine. The monofilament versus braid fishing line argument will probably rage on for 100 years. In the mean-time, let’s set one thing straight: monofilament has far better abrasion resistance than braid. You’ve probably heard this before, as I know I certainly have. But I hate to take words as fact – I like to put things to the test. And since I use braid a heck of a lot without ever noticing a huge difference, I wanted to be sure. We performed an abrasion test, using this rusty rebar as our abrasion machine. To perform our test we took samples of line, both braid and monofilament, in 20, 50, and 80 pound test. We got three samples of each, of three different brands. Then we took a rusty old length of rebar, and used it to abraid the line. Each piece was scraped against the metal three times, under five pounds of pressure. Then, we tested breaking strength with a hand scale. Finally, we averaged the numbers and looked at the results. With the 20 pound test, mono clearly did better but not by a huge margin. The monofilament lost about five percent of its stated strength, while the braid lost about 10 percent. (A note about stated strength – virtually all line manufacturers under-state the pound-test of the line, so it seems super-strong. Most 20 pound tests are actually more like 25). 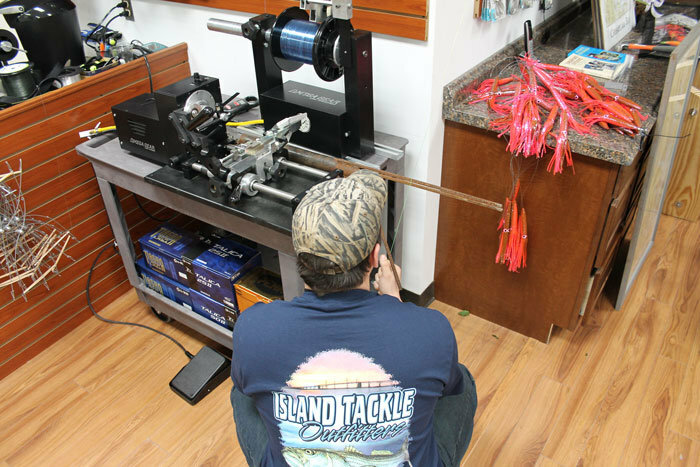 But we didn’t get the same results with 50 pound test—in that case, the braid line lost close to 25 percent of its strength while the monofilament lost around 10 percent. And with 80 pound test the difference became even more dramatic. We increased the number of rubs against the anchor, and the braid broke almost effortlessly. The mono, meanwhile, retained nearly all its strength. Here’s the bottom (ahem) line: not only is monofilament more abrasion-resistant than braid, the difference grows more and more dramatic as line diameter increases. So if you’re fishing with heavy gear for large fish, you absolutely, positively want plenty of mono shock leader on the end of your line. If you’re fishing around wrecks and reefs, having that mono there becomes even more imperative. Yes, it’s true: monofilament really does have better abrasion resistance than braid.